Almost once per week, I take a few minutes out of my day to sit down and properly paint my nails. I go through multiple steps, but my polish typically remains chip-free for at least 5 days on my fingers and 10 days on my toes. If this process intrigues you, read on! - Begin with clean, cut nails. - Apply a bit of softening gel along the cuticle of each nail. The best one ever is by Sally Hansen. - After 20 seconds, begin to push the cuticle skin off the nail bed, scraping with considerable pressure. If using a cuticle pusher is too difficult, you can use a strong nail on the opposite hand to do the pushing. - Wash the gel off your nails with the help of soap a nail brush, and don't leave it on for longer than a minute since it will begin to soften the actual nails. This step can be done 1-2 times per month. - Buff the surface of the nails using a buffer block. I like a uniform and fairly rough surface to my block, since I don't enjoy using the shining feature of a typical block. This pink one is only $2 (featured here) and smooths even the roughest ridges. Be gentle, but consistent. This step should be done no more than once per month. - At this point, I file down any rough edges, running the file in one consistent direction. Your nail beds should be completely dry before filing (See why, here). - Cautiously clip any loose pieces of skin around the nails using cuticle trimmers. - Use a bit of rubbing alcohol to remove any surface oil or dirt on the nails immediately before painting. Don't use nail polish remover- it doesn't work as well. - Apply your nail polish in thin coats. Take a bit more time and let them dry for a bit before adding the next layer. - Apply some fast-dry drops to help avoid smudging and speed up the dry time. - Apply cuticle conditioning cream, such as Healthy Hoof, a few times a week to keep your nail area strong and moisturized. -Use a wooden manicure stick to help push your cuticles back and/or clean around the nails when you're painting. They work perfectly at fixing minor polish slips and can also be used for nail art. -As you can see in the final picture above, I use pointed cotton swabs to clean up around my nails after I've painted them (my nails are bare, the image is just to show you the swab). These can be found at most dollar stores. - You can use oily drying drops to help speed up dry time and avoid little nicks after painting. -I find that all of my light coloured Essie polishes tend to get especially thick and clumpy after a few uses. If you want to thin-out a thickened polish, use OPI's nail polish thinner, pictured here. Simply add 3-5 drops into the bottle, then mix it up. Adding nail polish remover will only damage the polish. I've tried! 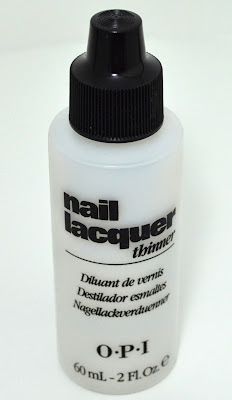 - If you use a small brush for nail art, you must use nail lacquer thinner to remove the polish from the brush. Regular nail polish remover will not work here either. - If you get a smudge, wet a finger and gently smooth out the mistake. Or you can lightly dip a fingertip into nail polish remover and rub that against the smudge to dull it down for re-application to the specific spot. 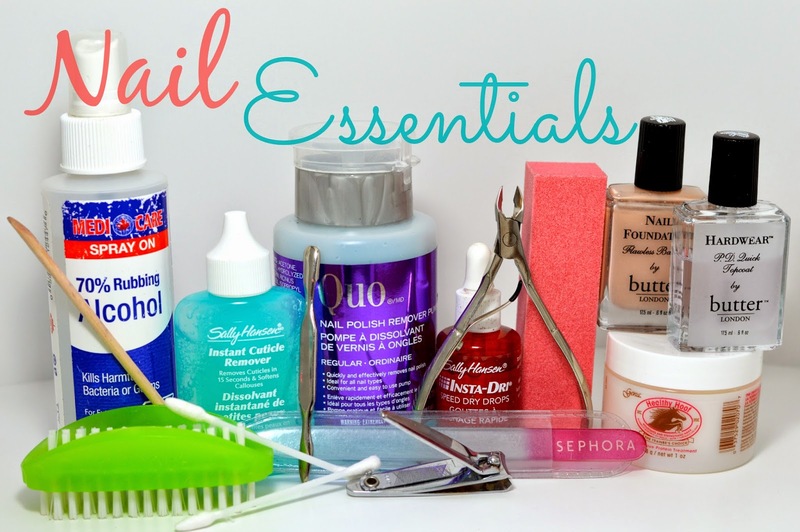 Mastering the at-home mani/pedi doesn't happen overnight. It took me years to learn how to paint with my right hand, and I still make mistakes. Just be sure to take your time and anchor your hands down on a table before painting. There is no real rhyme or reason to how I apply the polish, since each formula calls for a different technique. I always try to use a thin formula and apply two coats of colour to achieve my best results.